A dry well is an underground drainage system to dispose of unwanted water from driveways, roof runoff, grey water and storm water. The water percolates into the ground through the systems porous, perforated walls. If not maintained regularly, dry wells become ineffective and will not function properly. If that occurs, dry wells must be repaired by a company who understands these systems. 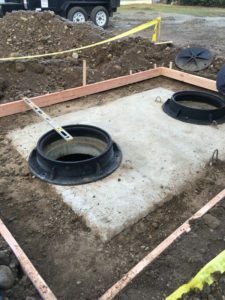 The dry well repair consists of cleaning out the system, causing no damage to the system and removing the debris that has accumulated in the well. We at Vac-Tec LLC have long been the company that Fife, WA residents call when they have problems with their dry wells. We are equipped with professional technicians who are well versed in the latest technologies for dry well repair. A dry well system of drainage disperses water into the ground through a tank in the ground that is perforated. Gravity then dissipates the water through these pores along sides and base of dry well system slowly into the ground. Whenever there is a problem with your dry well system, you can count on us. We pride ourselves in our efficient dry well services with the best in customer service. We have the staff, the knowledge, and the right equipment to handle an installation or repair of your dry well system. Poor maintenance can cause dry well problems. When your dry well is clogged or has other problems it will cause overflowing and water pooling. We have a team of well trained and experienced technicians who handle dry well problems systematically and scientifically. Dry well problems such as a dry well remaining full of water or backing up are managed with perfection. With our availability 24/7 we have become the go-to company in Fife to handle any dry well problems. For any dry well repairs, dry well system installation or dry well problems you may have in Fife, call Vac-Tec LLC at (253) 777-4887.